I haven’t shared a new recipe in a while, because I have really been focusing on different aspects of the health benefits of hot peppers lately. 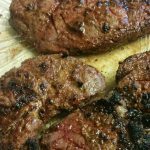 But I thought today it would be nice to get back to my roots for a minute and share with you the best grilled steak seasoning! This is really my favorite seasoning that I use almost every time I grill steak. There are obviously a lot of other tasty ways to season steak, but I find this to be reliably awesome and super simple. Plus my secret ingredient really kicks it up a notch! I went ahead and shook out each of these seasonings onto a simulated steak to give you actual measurements. However, when I season them myself I just shake each ingredient directly onto the steak in this exact order. My basic goal when seasoning is to make sure each item is sprinkled fairly evenly over each side of the steak. I do not cake the entire steak in seasoning, I just make sure there is enough of each ingredient to have consistent flavor with every bite. 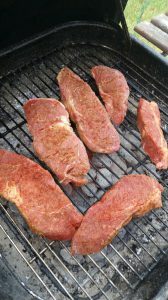 I generally try to buy thicker steaks, and I always make sure to season the sides of the steaks also. You want every bite to be flavorful and delicious. 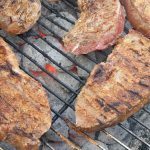 This recipe is for two good sized T-Bone/Porterhouse Steaks, or four smaller steaks, like petite sirloins. If you have really big steaks you may need to use a little more of each ingredient, but as I said you basically just want to sprinkle evenly on every side. The pictures I am showing here are petite sirloins. They are about 4 inches wide and 7 or 8 inches long. I, of course, prefer T-Bones or Porterhouses, but they don’t always fit into the budget. So, petite sirloins are usually my go-to for an inexpensive, yet decent steak. They seem to be on sale all the time, which works out great for me when I’m craving steak, but don’t want to shell out $40 for a couple T-Bones. If you have never tried Brother Bru Bru’s, you are missing out. 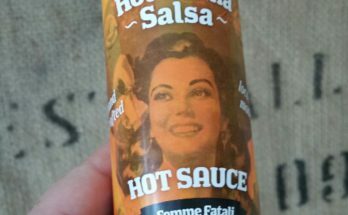 I don’t really ever use it as a hot sauce on cooked food, but it is awesome to put on before cooking. It doesn’t have a lot of flavor when you taste it out of the bottle. But for some reason when you shake some on a steak and grill it up, it is to die for! The Bru Bru sauce is kind of hard to shake out of the bottle. The way I apply it to the steak is by giving a good hard shake about 5 or 6 times onto the steak. Make sure to spread the shakes out so each drop or two is in a different area. Then I just kind of pat it down and smear it around just a little, so as not to disturb the seasoning too much. Now you can just slap those babies over some hot coals (lump charcoal is the best). Cook them about 5-7 minutes on each side. Make sure not to burn them. I love a little bit of char on mine, but you don’t want it burnt. So keep an eye on them. I like to flip my meat a lot, even though a lot of experts say not to. I am a real hands on cook. I always make sure to leave them alone for at least 2 or 3 minutes before I start messing with them, because otherwise you will end up losing your seasoning on the grill, on the tongs, and in the fire. Just make sure not to walk away or turn your back too long, a big flare up can happen in no time at all. It can be truly a tragedy to overcook a steak. So keep an eye on it. And remember the rule of thumb. 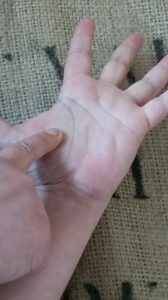 If you open your hand fully and push on the pad of your hand below your thumb that is how the meat should feel when it is perfect medium rare. Every time I make steak this way and take the first bite, it’s like the first time all over again. I start Ooo-ing and Ahh-ing about how delicious it is…so juicy and spicy and flavorful! Man, that’s some good stuff! I am making myself hungry. 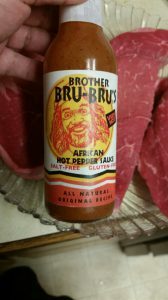 I first discovered the Brother Bru Bru’s African Pepper Hot Sauce (the original) a few years back at a local organic grocery store. For the longest time I could only find it at that one store. 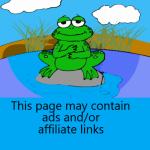 About a year or so ago though, I realized that that favorite little store of mine was sort of propagating a fraud. One day I was looking for a particular vegetable that I could not find, and in my asking the produce guy some question I came to find out that most of their vegetables were not organic. Which would be fine if they weren’t totally touting themselves as a kind of hippie, all natural, farmers market type place. I have been shopping there for nearly 20 years, the whole time believing I was getting safe and healthy vegetables…needless to say I was not happy to find out this information. I almost felt like picketing outside, because I know the other shoppers think the same thing I did. But I am not really the picketing type, So I just don’t go there anymore unless I need some rare spice from their bulk spice area that no one else carries. So, the point of all this is, I was very happy to find out that Brother Bru Bru’s is available online at Amazon, so I don’t have to go back to that store as often. 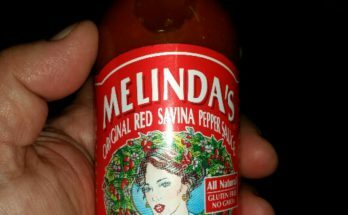 I have it listed on my Hot Sauce Shop page. Feel free to check it out there. You should definitely give this recipe a try and without a doubt get yourself a bottle of the awesome Bru Bru sauce! 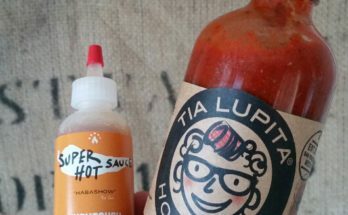 Even if you aren’t cooking steak, a few drops of the Bru Bru Hot Sauce is also great for adding a little spice to a vegetable stir fry, a roast, even a hamburger patty. The possibilities really are endless. In all my years of hot sauce love, I have never found any other hot sauce that works so great as a raw ingredient as the Brother Bru Bru sauce does. I hope you are able to get some and see for yourself. You won’t be disappointed. If you have any questions, comments, or suggestions please let me know by leaving comment below. See you next time!